Singapore Airlines offers great value fares to customers traveling to Singapore and selected points in Australia and Europe from 11 May to 22 May 2009, for travel from 11 May to 30 June 2009. In addition to above, customers can choose to stopover in Singapore on their way to their Australia and European destinations with our "Fabulous Singapore Stopover" package from just US$1 each for the first night stay in Singapore, based on per person on a twin-share basis. The package covers exclusive deals on hotel accommodation, airport transfers, unlimited ride in SIA Hop-On Bus and free admission to major attractions in Singapore. 1) The above fares is per passenger and include relevant taxes, fuel surcharge and insurance according to exchange rates on May 11th 2009. It is subject to change based on exchange rates. 2) Relevant Terms and Conditions applies. 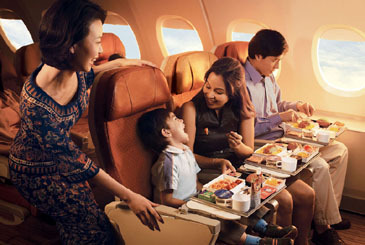 For more details, please visit our website, singaporeair.com/kr or the nearest Singapore Airlines appointed travel agency. Singapore Airlines offers the most convenient schedule for customers going to Singapore and more than 60 destinations beyond. Enroute, enjoy KrisWorld, our inflight entertainment system, World Gourmet Cuisines and inflight service even other airlines talk about.